Dr Yadvendradev Jhala has done B Sc in Zoology and M Sc in Animal Physiology from University of Bombay. He then did Wildlife Conservation and Management Training Program at the Conservation and Research Center, Smithsonian Institution, USA. Post that he did Ph D in Wildlife Science from Virginia Polytechnic Institute and State University. He has also been a Post-doctoral Research Fellow at the National Zoological Park, Smithsonian Institution, USA. He has been a Lecturer of Zoology at St Xavier's College. He has also been a FAO Consultant in Sri Lanka for training Park Managers in Wildlife Science and Management. He is Scientist G and Senior professor at Wildlife Institute of India. Wildlife conservation is the practice of protecting wild plant and animal species and their habitat. Wildlife plays an important role in balancing the environment and provides stability to different natural processes of nature. "I have done B Sc in Zoology and M Sc in Animal Physiology from University of Bombay. I then did Wildlife Conservation and Management Training Program at the Conservation and Research Center, Smithsonian Institution, USA. Post that I did Ph D in Wildlife Science from Virginia Polytechnic Institute and State University. I have also been a Post-doctoral Research Fellow at the National Zoological Park, Smithsonian Institution, USA. I have been a Lecturer of Zoology at St Xavier's College. I have also been a FAO Consultant in Sri Lanka for training Park Managers in Wildlife Science and Management. 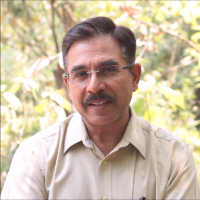 I am Scientist G and Senior professor at Wildlife Institute of India."